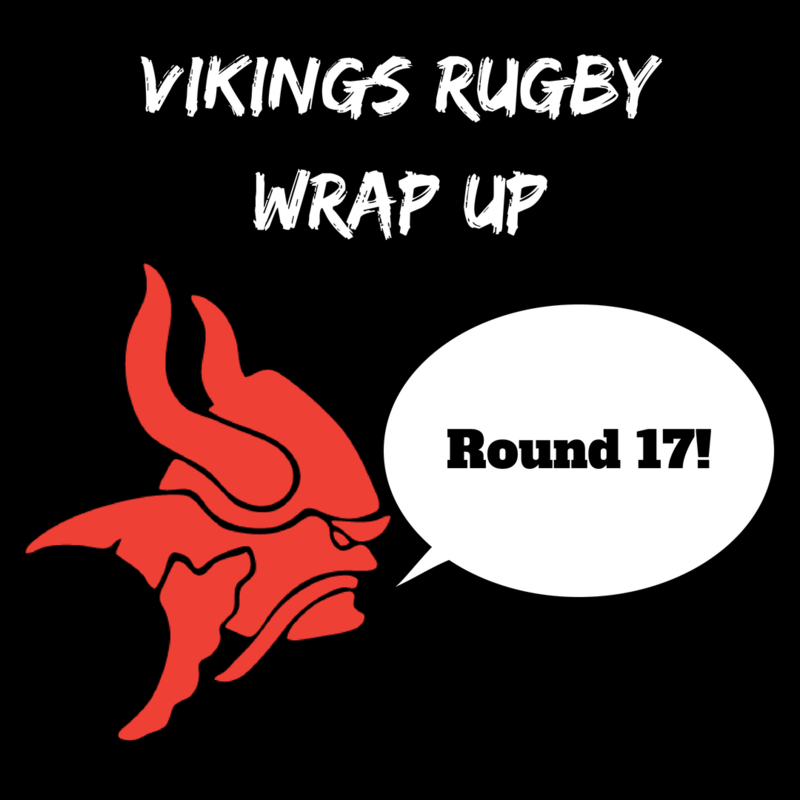 It was the final round of the regular season over the weekend, with each of the Vikings Grades looking to build some momentum as they all head into Major Semi-Finals on August 4th. The Premier Grades, 3rd Grade and the ViQueens were out at Griffith Oval, taking on Easts, Easts/RMC and Royals respectively. 4th Grade were over at Portsea Oval, taking on RMC in a top of the table clash. The Vikings went 5 from 6 but will be happy with some solid team performances. It was a hard fought game at Portsea Oval between 4th Grade and RMC – RMC were in a do or die situation, having to win the match to have any hope of playing finals. Willed by this reality and a strong group of supporters, RMC stuck it to the Vikings. But our boys wouldn’t go down without a fight, putting on a great display of Rugby to finish the match with the Minor Premiership. Although so late in the season, 4th Grade welcomed several new faces to the fold – Jack Mann and Jack Gilmour, both Colts age players, returned from injury to add some real flair and youth, playing pivotal roles in a close encounter. Bryce Taotua also had a great game at inside centre, playing with physicality and poise. With the game on the line, the Vikings found themselves 5m out with an attacking line out. Ryan Slater, who had been throwing pies all day, hit Grant Lukins right on the spot. But, just as the Manteena Award had slipped from his grasp so many times in the early rounds of the season, so too would this opportunity, Granni fumbling the ball and cursing himself rather loudly to the amusement of those in attendance. Although the Vikings were persistent, they gave away too many opportunities, RMC taking advantage and stealing the game. The Vikings went down, 33-26. 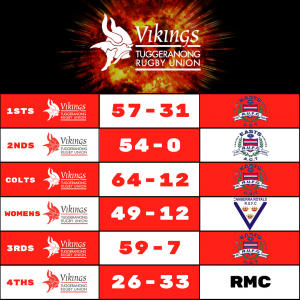 Thanks to a 4 try bonus point and a loss within 7 points, however, the Vikings finished on top in 1st Division 2nd Grade. The Thirsty Thirds took on Easts over at Griffith Oval, their spot in a Major Semi-Final already secure. Although 3rd Grade won by a margin, they will be looking for a much improved performance coming into the finals, having played rather comfortably knowing that they would be playing the week after. The Vikings started strong, imposing their massive forward pack on Easts early to assert their dominance. Nick Cushan continues to impress, as does big Pou Ahome’e, both players gaining plenty of metres with each carry. Out in the backs, 3rd Grade welcomed back Carl Johnson who had a great game at inside centre, his handling skills opening up opportunities for Steven Niovanni and the other outside backs to quickly race away with the lead. The back end of the first half and the start of the second were rather slow for the Vikings, flirting with the dangerous ‘C’ word (complacency) in patches of the match. But thanks to the injection of some handy bench players and a resolve to finish well, the Vikings closed out the match, 59-7. The ViQueens joined the Premier Grades and 3rd Grade at Griffith Oval, facing Royals for the second time in three weeks to cap off their season. With the Minor Premiership in sight, the girls gave it to their opposition, playing some smart, clinical Rugby as they have done all year to send a message one week out from Finals. Emily Sogal was outstanding – after receiving a roasting from her team mates and this writer last week, she slotted 7 from 7, bagged a meat pie and played a crucial role in the forwards dominating the match. Try Machine Tayla Stanford also came away with a hat trick to be well and truly in front for the Club’s highest try scorer tally. The ViQueens are looking super impressive heading into their Major Semi-Final this weekend – although they face a tough challenge against the Uni-North Owls, their forward play and backline composure has shaped up incredibly well in the last few weeks – they will be sure to make 2018 a year to remember. ViQueens finish the regular season undefeated, 49-12. Like the ViQueens, the Colties were playing to remain undefeated in the regular season. The Vikings started well, although scrappy at times, but were able to stack on the points in the first half. Billy Carberry was his usual best again, joined by the Hot Knife Riley Turner who had some rampaging runs. Seamus Smith helped exploit the short side with some smart decision making and a few sneaky darts himself. Although they played uncontested scrums for the majority of the game, the Colts set piece plays looked awesome, finding themselves in space on several occasions. What was also pleasing was their composure in the 22 – with the majority of their tries coming off the back of big line breaks, the Colts were able to recycle ball quickly and effectively, which will prove massive in weeks to come. A big shout out to Ben Gillespie, who was self-proclaimed victor in ‘Gillespie v Watego II’. Ben was awarded Player’s Player for his efforts. Vikings 64-12. The Dirty Twos had a polished performance against Easts on the weekend, performing to the standard they are capable of. Blake Henman led the Vikings out for his 100th game – Blake has been a great member of our Club, having progressed through the Junior Vikings pathway to the seniors. Blake has had a great 2018, featuring in several 1st Grade games and playing some exceptional Rugby. Congratulations again, Blake! 2nd Grade played a physical game of Rugby, forwards and backs a like. Joey Vejvoda and Richard Joyes were destructive in the forwards, Joey in particular, who was a threat at the breakdown and backed up several times to carry. Noah Lolesio stole the show, though, continuing on the form that has seen him play a crucial role for 1st Grade this year, as well as nabbing a brace of tries. The Vikings will be pleased with their defensive efforts, having not conceded a single point in this match. With a big match against Queanbeyan in the Major Semi-Final, 2nd Grade will be hoping to take some of the momentum from the last few weeks and secure a spot in the GF. Vikings 54-0. 1st Grade came up against an Easts outfit desperate for a win in their final game of the season, having come just shy of a Finals appearance. Easts had named arguably one of their strongest teams for the year, but the Vikings would keep their opposition at bay for a great victory just shy of the Finals. With Ernest Suavai and Max Ravouvou late withdrawals from the match, the Vikings made some last minute adjustments to the starting side to ensure that nothing was lost in their preparation. The Vikings started quickly, gaining the momentum of the match and racing to an early lead. Michael Oakman-Hunt had another great game at blindside flanker, joined by 1st Grade debutant Cooper Taekata who continued his recent form, proving he can match it at the highest level in the ACT. Easts staged a comeback towards the back end of the first half, their forwards imposing their size and strength at the breakdown to shift things in their favour. By the start of the second half, though, the Vikings were in full swing, playing some clinical attacking Rugby worthy of finals footy. Two young players earned their 1st Grade debuts – Billy Carberry and Turi Hides came on towards the end of the match and thrived on the big stage. It was great to watch, both players worthy of the reward having made a huge impact at the Club in their first year. Although there were some late tries scored by Easts, there were no concerns from Coach Scrivener, who was pleased with his side’s overall performance as they head into a big Major Semi. Vikings 57-31. And that’s a wrap for Round 17, the final round of the season. Thanks to Easts Rugby and RMC for hosting us. Be sure to head down to Viking Park next week from 10:55am to watch all Grades participate in Major Semi-Finals!